In the past I vowed never to talk about the weather. But in Texas, it's completely unavoidable. It really is as crazy as people say. Today 70's and no freezes in sight. Last year we were just watching the last bits of several of inches of snow melt from the shady parts of our yard. This year, I've planted 12 varieties of heirloom tomatoes already. Last year the same heirloom varietals were being nursed through a cold March in our garage to be planted in April. But this post is not about tomatoes or about the weather. It's about potatoes - growing them, harvesting them and then roasting and serving them and other Early Spring Vegetables with Romesco Sauce. 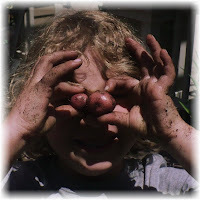 Several years ago during our first Napa Valley spring, we planted potatoes. I should say my mini-chef and gardener planted them. My youngest son (and now biggest) has always had this way of just casually tossing seeds into a bed of dirt and growing stuff. First when he was only two, he tossed bean and pea seeds in a wine barrel of dirt. I figured they would do nothing, but they ended up being more plentiful than the ones I planted in my perfectly symmetrical raised bed. Then we found "seed potatoes" after unsuccessfully locating straw to grow them in since wine country doesn't typically have a need for straw, he just threw them in another (or possibly the same?) wine barrel of dirt. A few weeks later he started investigating his "garden" and found several tiny potatoes. With the excitement that only a five year old can exude, I couldn't stop him after that. It was like a treasure hunt for him. I convinced him to leave a few for Harrison to "discover" since he had already dug up seven and was so proud and we decided that these treasures would be dinner for the evening. I had received several early Spring vegatables in my Riverdog box along with a few of their Russian Banana fingerlings and thick asparagus spears, so drawing on my love for Mediterranean cuisine (and the fact that Napa Valley has exactly the same climate as the Mediterranean) I decided to combine a Spanish tapas bar favorite, Romesco sauce with a Provencal vegetable-centric meal, the Grande Aioli (a meal of vegetables, fish or cured meats and boiled eggs served with aioli sauce). We wrapped the asparagus in proscuitto and roasted all the veggies then served everything with a bit of herbed feta, lettuce leaves and the spicy sauce. With basically a platter of veggies as the centerpiece for dinner and a pepper based sauce to boot, there was the thought in the back of my head that I would have to let the boys grab some peanut butter and jelly if they didn't like it. I was totally wrong! Who knew that a 10 year old could create something as delicious as proscuitto-wrapped asparagus in lettuce wraps schmeared with Romesco sauce and feta? He started the trend then the rest of the table followed. I almost had to contemplate the PB&J again not because they didn't like it but because they were eating it all so fast! Since then, we have had this multiple times. 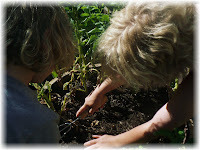 With Spring approaching and potatoes ready to go in the ground, I hope even though my kids are almost grown, they will like it just as much when I serve it this year. The great thing about Early Spring Vegetables with Romesco Sauce is that you can use any vegetables that you find at your farmers market or at the grocery if your farmers markets haven't opened yet. Look for small Tokyo turnips, Parisian (round carrots) and Chioggia beets if you want to try some beautiful and colorful varieties. If you aren't growing your own potatoes, look for the mixed color fingerlings that are so easy to find now. The whole idea with this is you want lots of color since you will be serving this on big platters. Now the sauce...first...YUM! It is a classic sauce made with lots of peppers and chiles ground together with almonds and garlic. Besides being a perfect accompaniment to this platter of veggies, it is amazing spread on broiled or grilled fish and can really elevate a weeknight simple chicken breast. Make a double batch and keep it in your freezer for just this sort of thing. Want to impress your Tuesday night dining companions? Whip up a roasted chicken with potatoes and serve this sauce alongside. Even easier? Pick up a roasted chicken, slice it and serve this sauce on top. They never have to know you didn't roast the chicken yourself. To make this simple vegetable-centric meal fit for a casual dinner party serve it with Mediterranean wine varietals. If you are serving it on a warm night, a juicy French Rose will make it more like a Provence meal, but to stick with the Spanish theme, serve with a Tempranillo. Since the sauce is what makes this whole thing, I'll give you that recipe then you can wing it from there. Leave me a comment to let me know how you use it! Place the almonds in a small skillet with the olive oil. Fry the almonds until dark blond in color. Remove immediately from heat and using a slotted spoon scoop almonds into blender container, reserving oil. Seed ancho chile and place in a small bowl along with enough water to cover. Microwave on high for 1-2 minutes then let stand while assembling remaining ingredients. Drain roasted red peppers and add to blender along with garlic, paprikas, cayenne and vinegar. When ancho chile is soft, add it to the blender with the olive oil and 1 teaspoon sea salt. Blend until smooth, then taste to balance the flavors of the sauce. It should taste slightly smoky from the ancho and the paprika, but mostly you should be able to taste the roasty pepper and toasty almonds as they are the stars. Sea salt and more vinegar will bring a little punch to the earthy vegetables, so be generous. Use whatever veggies you have and add boiled eggs for protein. If asparagus is in season, try the prosciutto wrapped version or simply roast with other veggies.